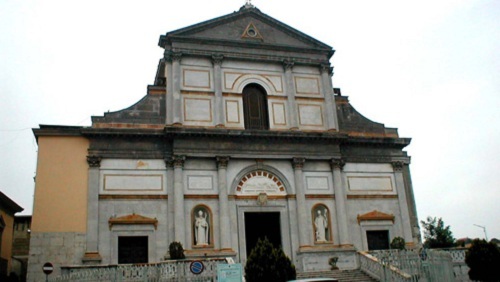 A trip to the Avellino province is a journey into nature and the history of Irpinia. A charming land welcomes the visitor with a gorgeous landscape and an interesting cultural heritage. An incredibly beautiful nature, the same that inspired the name ‘Green Irpinia’. Discovering every corner is an experience that will last in the memory forever. Mountains, vast plains, wonderful reserves, lakes and rivers make this land the perfect destination for those who love nature and who look for a holiday in total relaxation among mountains and springs, fresh air and great food year-round. Irpinia opens itself up slowly, through a journey that takes the visitor into the wilderness to the ancient times, when this land was inhabited by Samnites, Romans and Longobards. Old villages nestled in the green of the valleys that start at the base of the Partenio and Terminio Mountains, covered by beech, fir, oak and chestnut. In addition to the archeological sites, there are massive castles that bring back to the memory not only wars and plundering, sieges and battles, but also celebrations and elegant courts. In the valleys, vineyards and olive groves that provide with an excellent production of wine and oil. These are places that tell how man and nature have learned to live in harmony and respectfully since the early ages. Avellino, the province seat, has maintained the small old village despite the tragic earthquake, with narrow streets along which one finds the Clock Tower, the Cathedral and the Castle, symbols of the city. On the Partenio Mountain there is the Montevergine Sanctuary, which can be reached walking up a road that is worth the effort for the rewarding views. As the hike continues, the panorama opens on the whole valley and, on sunny days, all the way to the sea. 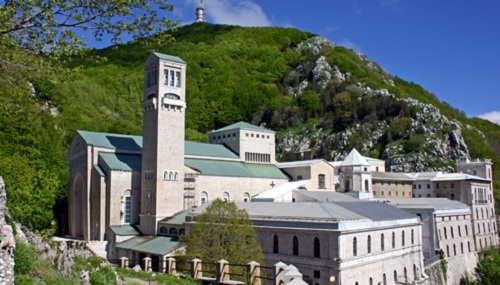 The basilica has two components: a modern one, built in the second half of the 1900s, which protects the large table of the S. Mary of Montevergine, and an old section with a beautiful altar, finely adorned with mother of pearl and gems. Nearby, in Mercogliano’s Palazzo Abbaziale of Loreto there are historic and religious documents, some of which dating back to the first century, and over 300 majolica vases of the old pharmacy. 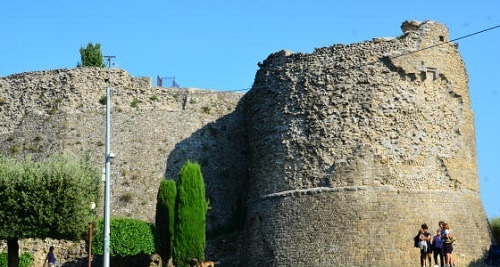 The medieval period is narrated through the main castles that overlook the villages of the province; defence buildings that, in some cases, have been transformed in residences during the Renaissance. Among them, the Montemiletto’s Castle of the Leonessa, one of the best preserved of the Avellino area, the Lauro’s Lancellotti Castle, completely restored in the second half of the 19th century, and Ariano Irpino’s Castle, which dominates the town from a strategic, almost inaccessible position. Visiting these castles, either intact or in ruins, restored or abandoned, becomes an opportunity to combine pleasant walks among the streets with the discovery of the local cuisine. This is an ancient, generous and unpredictable land that conceals countless itineraries to discover it without getting lost. Trekking, hiking and mountain biking are great ways to explore the enchanted places scattered throughout the Apennine range, making sure to take a break in a local ‘trattoria’ where the cuisine reflects the traditions of the area. Near Bagnoli Irpino there is the gorgeous Lake Laceno, nestled among mountains covered by beech and conifer woods, a popular summer destination for those who seek a holiday in the quiet of a pristine environment. A highly recommended itinerary is the Fiumara di Tannera, a series of crystal-clear streams and waterfalls. Cervialto, Raiamagra, Cervarolo, Montagna Grande and Piscacca are peaks with extraordinary views, ideal for the photography enthusiasts; as an alternative, one can search for the local treasures hidden in the dense woods such as sought-after mushrooms and black truffle. Bewitching in the summer and during the winter, when a white blanket covers the whole area turning Laceno in a popular ski resort equipped with modern lifts and excellent facilities. These mountains offer many opportunities for alpine and cross-country skiing, as well as ice climbing. 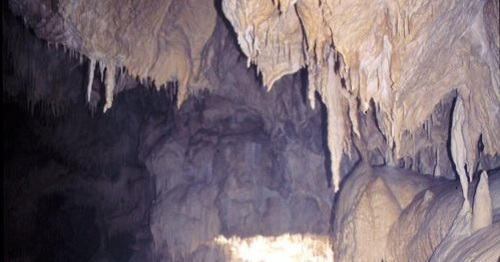 The speleology enthusiasts should visit the Grotta del Caliendo, an underground world to explore through the infinite shades of colour reflected on this long corridor, in the silence of a place that will provide unforgettable feelings. The keyword for the time of the Carnevale in this area is fun! 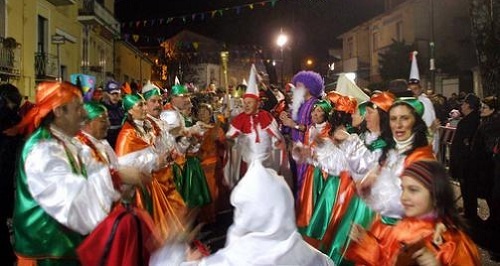 Every town, from Montemarano to Taurano, from Avellino to Castelvetere sul Calore is inebriated with the magical sequence of costumes and colours, in the rejuvenating turmoil and the wild rhythm of the music and dance. The Irpinian cuisine is characterized by the fertility of its land and the dedication of its people toward it. 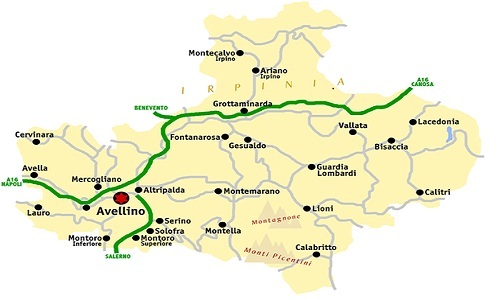 The relationship between man and the land has allowed the Avellino province to excel for the quality of its products. The distance from the sea, whose flavours are the trademark of the region’s cuisine, is balanced by the quality of the meat, especially ovine and pork. Some examples are: ‘capocollo’, ‘soppressata’, bacon and the ‘fiocco di prosciutto’. 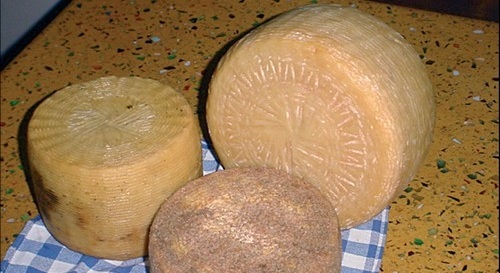 The cheese production is also remarkable, thanks to the milk obtained by the Laticauda and Bagnolese sheep breedings: Pecorino Carmasciano (still prepared traditionally), Pecorino Bagnolese (with its slightly hot aftertaste), Ricotta Laticauda (fresh and light but with a strong milky flavour) are only a few examples of the specialties found in the Avellino area. 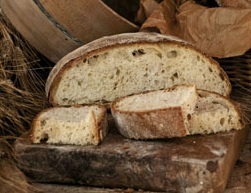 To be fully enjoyed, cold meats and cheeses need nothing more than a slice of the Irpinian bread, which is still made in a traditional fashion to confer the breads from Calitri, Iurmano and Montecalvo unique shape, smell and flavour. ‘Peperone Quagliettano’, ‘cipolla ramata’ and Montoro’s artichoke, Volturara Irpina’s beans are some of the best examples of the characteristic products of this land, flavours that delight the taste buds when eating a bean soup with the ‘friselle’, a ‘ciambottella’, or the Santa Lucia’s ‘cicci’. As far as desserts are concerned, the area is famous for its ‘torrone’, dressed with the local hazelnuts or chestnuts. The crumbly ‘spantorrone’ is wrapped in sponge cake dipped in rhum and Strega liquor. the Taurasi, with an intense smell but smooth flavour, the Greco di Tufo, fruity with a slight almond aftertaste, and the Fiano di Avellino, protected and guaranteed by the DOCG label.